that give Luz de Luna it's unique style. This style has led to musical collaborations with Indie-Rock group Calexico, The Ronstadt Generations, Kate Becker & Friends and others. They have also done recording and appearances throughout Europe, Canada and the US. ​Bon Jovi and Jackson Brown, as well as being on the Jimmy Kimmel Show, and more recently at the football halftime show of the Arizona Bowl. 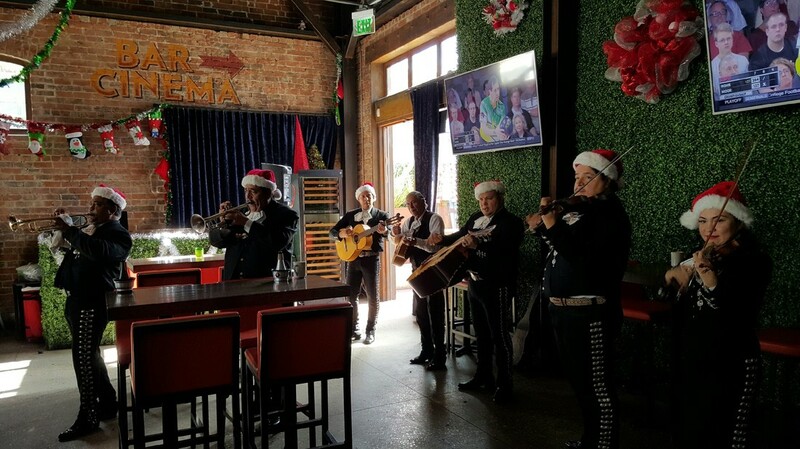 Mariachi Luz de Luna continues to contribute to the local mariachi movement by teaching in the area high schools, the Tucson International Mariachi Conference and can be seen every Sunday for Brunch at The Playground, in downtown Tucson. Mariachi Luz de Luna, Tucson, Arizona. 2016 was highlighted by a performance at the iconic Whistle Stop in Tucson, Az. with world-class musicians, The Ronstadt Generations and Kate Becker and the All Star Band at Kate's CD release celebration. 2017 promises to be another fun filled year for Mariachi Luz de Luna. Their schedule heated up in March with the band being featured as the Half-time entertainment at the Arizona Bowl. Continuing to explore new musical venues and sounds, composer/director, Ruben Moreno, fellow band member/composer, John Contreras, Chamberlab creator Chris Black, and fellow musician, Marco Rosano, collaborated and broke new ground by turning to traditional Mexican Folk Tales for musical inspiration. Teaming up with puppet master, Matt Cotten, the composers/musicians wrote classically structured music played with a Mariachi sound to accompany the folktales acted out by the Puppets. Mariachi Luz de Luna performed this boundary-breaking concert at the Scottish Rite Temple and performing center in downtown Tucson. It's kind of an experiment and exploration for us. We're out of our element playing classical music," added Moreno. "These are folk tales being told from the Mexican origin that can be told pretty much from pictures; you don't need narration. It's a really cool way to tell a story because music says what words can not. That's how powerful music can be." 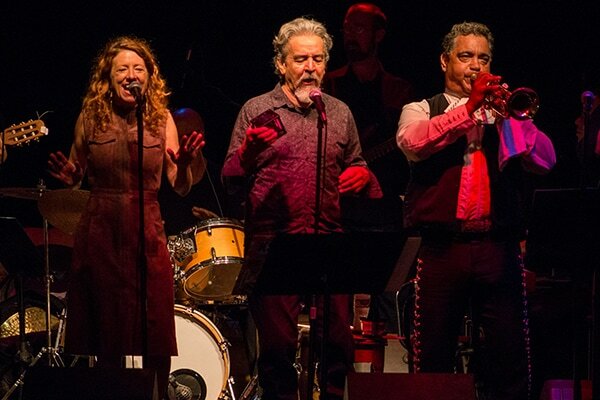 Kate Becker, Salvador Duran and Ruben Moreno onstage at the Whistle Stop in Tucson, Az. 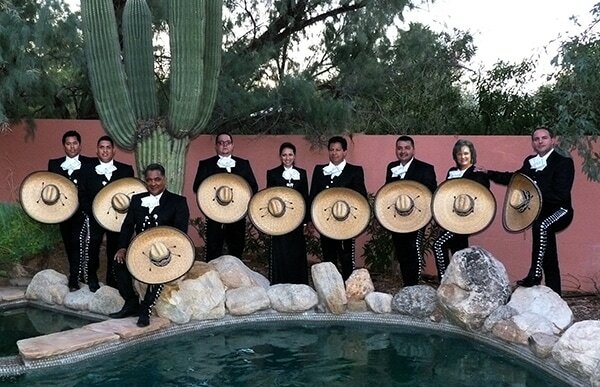 Mariachi Luz de Luna accompanying American Idol finalist, Brooke Sample, at the Arizona Bowl. Please go to our CONTRACT page to book a performance. in the United States and internationally since 1974, starting with the highly acclaimed Mariachi Cobre, which now plays at The Mexico Pavilion at the Epcot Center in Orlando, Florida. He has performed at several music festivals worldwide including the Leeds and Redding Festivals in England, and the Edinburg Festival in Scotland where his band, International Mariachi America, was awarded the Special Performance Award. Today performing as Mariachi Luz de Luna, he has worked internationally and toured extensively with Tucson alternative rock band “Calexico”. More recently, Mariachi Luz de Luna was featured at the ‘Les Escale Music Festival” in St. Nazaire, France; were featured halftime performers of the Nova Home Loan Arizona Bowl, and collaborated in a wonderfully successful Chamberlab presentation of mariachi fusion with chamber music called Leyendas y Sombras. 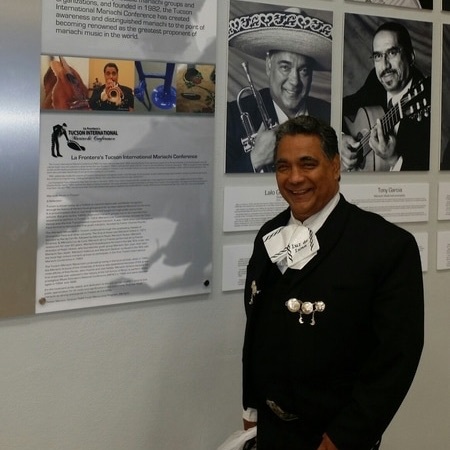 Focused on educating younger generations about the tradition of mariachi music, Ruben has helped shape the mariachi curriculum at several local high schools. He has started and assisted more start-ups of mariachi programs and conferences than any other individual in the United States. 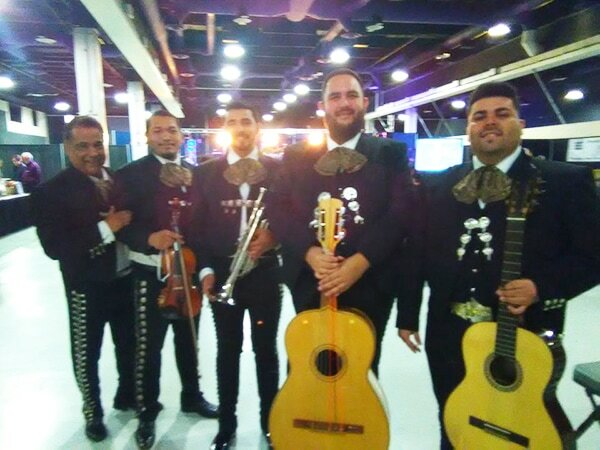 Graduate and co-founder of the University of Arizona’s Mariachi Arizona, this group was the first to perform at the prestigious Music Educators National Conference from The U of A’s School of Music in 1992. Ruben has many film, television, concert, video, CD, DVD and radio appearances that include internationally known performers such as Paul McCartney, Linda Ronstadt, Kenny Rogers, Glenn Close, Keith Carradine, Jackson Browne, Jon Bon Jovi, Calexico and Mexican artists Miguel Aceves Mejia, Vicente Fernandez, Lola Beltran, Jenny Rivera and the ever great mariachi Vargas de Tecalitlan. You must tell us about the event to receive a quote.